Make sure to subscribe to me on YouTube. I make a ton of great content and am hoping to reach 3,000 subs by Christmas. Thank you in advance! Much love to you all! Thank you to everyone who has followed my blog. I want you all to know how much i truly appreciate you and how much enjoyment I have had bringing these articles to you on a nearly daily basis. Since I’m entering the realm of video production, I will have less time to write. I’m not going to stop writing altogether because I love it. However there will be less articles written throughout the week in order to give me more time for video and voice recording as well as all of the editing involved in getting a video put together. So tonight I thought I would give you a layout for how these changes are going to affect the blog. 1 or 2 short videos per week. A Pentecostal Atheist Bible Study will be a Bi-Weekly video. Satanic Sunday is now going to become a Bi-Weekly video. Just a Thought: These will be Memes that I found funny or thought-provoking. Anyway, I hope you enjoy the new schedule and continue following this blog. Thanks again! 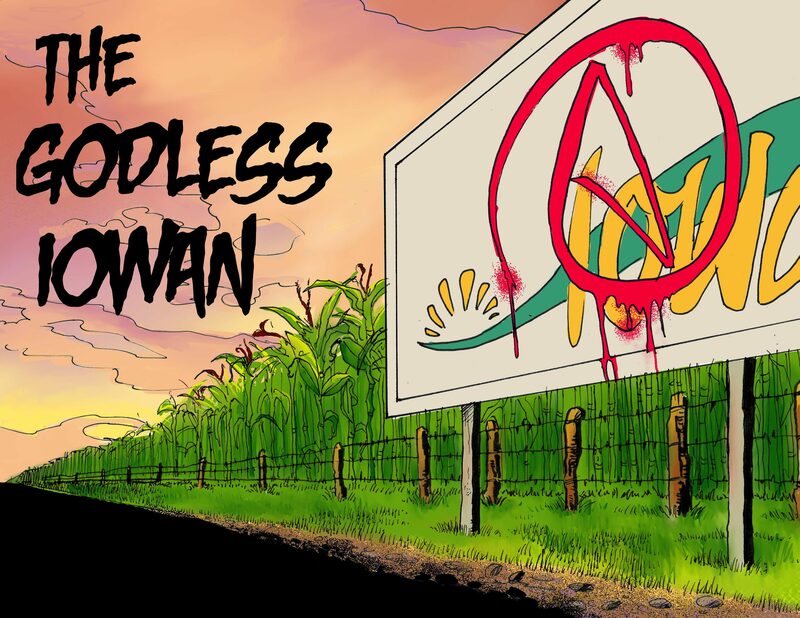 If you haven’t checked it out yet, this is the new logo here at The Godless Iowan Blog. Special thanks goes to @ArtofTCBaldwin for this amazing piece. I love it. Thank you so much man! So to start, I’d just like to say thank you to everyone that has read this blog consistently over the last several months. I hope that you will continue to read in the future. If you have read my recent posts you will know that my life has been turned upside down a bit and I’m having a bit of an existential crisis. I’ve been a jumble of emotions, which is odd for me, and I’ve had great difficulty putting my thoughts together over the last few weeks, this has been especially hard in trying to keep up with the daily schedule that I laid out awhile back. So with that said, this blog is going to go into a new direction. Have no fear, you will still see all of the articles that I have been writing here but they will not be added in the weekly format. I love writing but I find that the quality of my writing goes down greatly when I try following a format. Thinking, it’s Monday so I need to write this article destroys my motivation many days, which I believe shows in the writing. So from now on, I will write what I want, when I want to write it. We will still have Wednesday Woo written by my wife and Free-thought Friday, written by a guest blogger, but outside of that the articles will be more off the wall and hopefully better written. Thank you once again to everyone that has read so far. Probably going to take a day off today from blogging. Head is killing me this morning and I just don’t feel so well. If I post anything it will be later tonight. Thank you to everyone who reads this blog.